I was quite excited to see the Coriander scent released in the form a body butter. 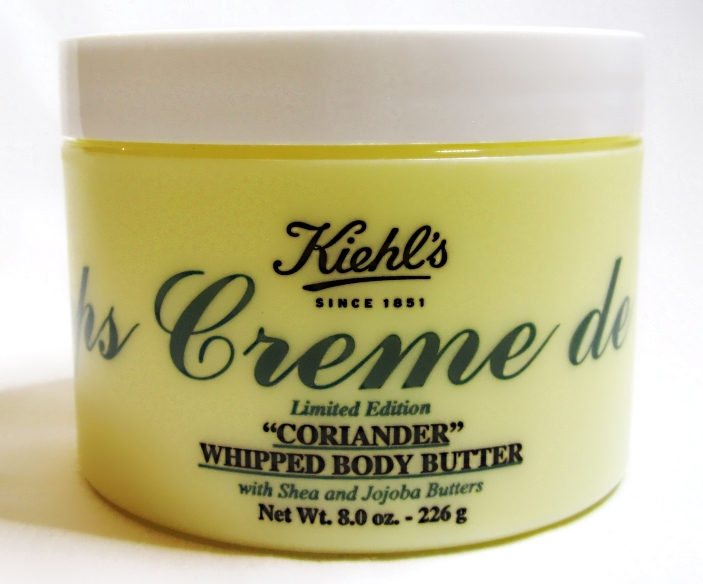 I had never tried Kiehl’s Creme de Corps lotion or body butter before, but I got over the initial sticker shock ($46 for body butter?!) and bought this during the Friends and Family sale (20% off). The biggest draw of this body butter for me is the Coriander scent so I’ll describe the fragrance. The idea of a herb smell doesn’t sound appealing, does it? The notes in the Essence Oil are: coriander oil, orange oil and patchouli. The patchouli is very faint (I’m not normally a fan of patchouli) and to me, this smells mostly like grass mixed with a bit of spice and citrus. I honestly think this scent should have been renamed to Grass Spice or Green Citrus, and maybe it would have been more appealing. The scent is fresh but not juvenile and it evokes casual weekends shopping for artisan vegetables at a farmers market (that’s what I imagine anyway). The Coriander scent is captured true to the original Essence Oil in this body butter. Nothing like opening up a fresh jar of body butter! 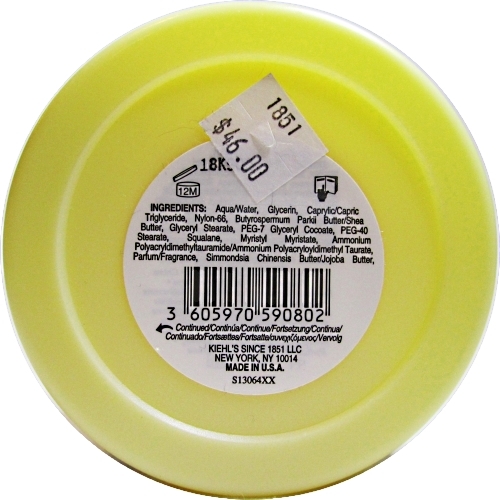 The body butter is a bright, almost artificial looking, shade of yellow. 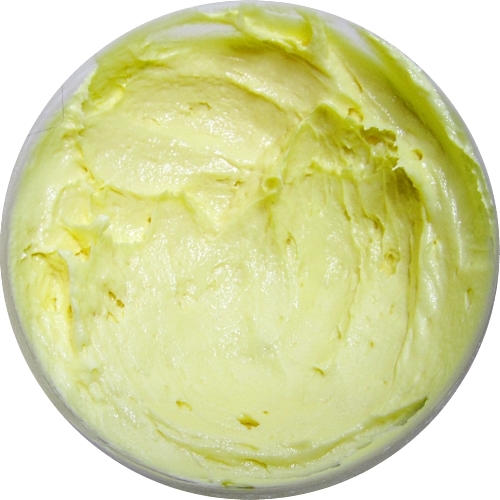 Its key ingredients are shea butter, squalane, jojoba oil, and beta-carotene. Only a small amount of the body butter is needed per application – it feels light and silky, and not greasy on the skin due to its whipped texture. It’s not as rich as other body butters like The Body Shop’s or one of my favourites, the Biotherm Beurre Corporel Body Butter (I have both [unopened] in my stash) but this gets the job done. I’m enjoying using this and will be sad once it’s gone. I hope Kiehl’s repeats this scent in the future. 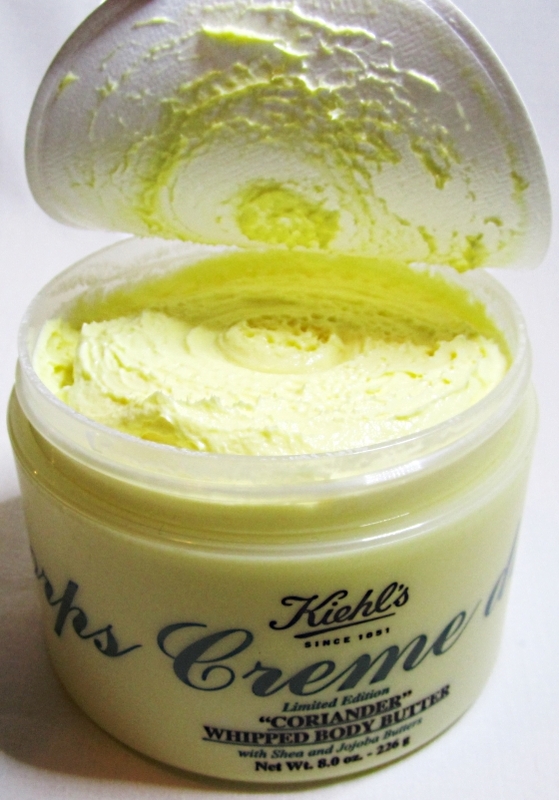 I have another Kiehl’s Creme de Corps Whipped Body Butter in my stash from just this past holiday season, the Soy Milk & Honey scent (which also smells amazing), in the limited edition Craig & Karl designed jar (you’ll notice a pattern here, I’m a sucker for all things limited edition). I’ll probably get around to opening that jar next winter, at the rate I’m going! After 2 weeks of use. Omg it really looks like whipped butter!! I’m a Kiehl’s products virgin 😉 That’s one of the brands I really REALLY want to try this year !!! Of wow, you’re really going back into my old posts. And now I realized I haven’t responded to other comments on this post and it feels weird to respond to them more than a year later! XD Blogger problems. Are you even applying body lotion once a week?! !